Mumbai: Initial share sales by new-age tech and healthcare firms, micro lenders and even old-economy companies have been snapped up by investors, those looking for listing day gains as well as long-term bets, ending a four-year lull in the primary market. On Thursday, Mahanagar Gas Ltd (MGL) joined the list of top-drawing initial public offerings (IPOs) as its ₹ 1,040 crore issue closed with demand for 64.5 times the shares on offer, stock exchange data showed. Shares of the natural gas distribution company were quoting at a premium of ₹ 115-120 apiece in the grey market as bid worth ₹ 43,000 crore (at the lower band) poured in via 975,000-plus applications. The subscription, in value as well as volume (application) terms, was the highest since the initial share sale by manganese miner MOIL Ltd in December 2010, said investment bankers. Initial signs of a pick-up in the primary market were visible when Noida-based Inox Wind Ltd received demand for nearly 19 times the shares on offer in its ₹ 1,000-crore IPO. Inox gained 35% on listing day in April 2015, helping some other infrastructure-related firms to take another look at primary markets. Six companies, excluding Inox, went on to raise capital through IPOs, data showed. Prithvi Haldea, founder chairman of Prime Database, a primary market tracker, maintains that quality issues by companies with a strong management and financial track record will always find buyers. In a Mint report on 12 August 2015, Haldea said that Indian primary market was in the initial stage of another IPO bull run. Good companies had launched their public issues with decent valuations, leaving enough room for investors to make money post listing, Haldea said. Karnataka-based transportation and logistics company VRL Logistics Ltd had done just that. Its ₹ 467 crore IPO was subscribed 74 times in April 2015 and listed at a 40% premium to its offer price of ₹ 205 per share at the end of that month. The stock price is currently up more than 50% on the BSE, after tripling in value August last year. In April 2016, Navi Mumbai-based healthcare and diagnostics company Thyrocare Technologies Ltd received demand for 73 times the stock on offer in its Rs.480 crore initial share sale as investors bet on the growth potential of its business. Thyrocare’s stock jumped 39% on debut in early May. Alkem Laboratories Ltd ( ₹ 1,350 crore), Dr Lal Pathlabs Ltd ( ₹ 631 crore) and Syngene International Ltd ( ₹ 550 crore) are other healthcare companies that tapped primary markets in the last one year. Their IPOs, prior to Thyrocare’s, received stellar feedback from investors too as is indicative in their stock price – all up 31-60% from their offer price. The 2016 calendar year has also seen two of the 10 small finance bank (SFB) licensees go public. Equitas Holdings Ltd’s ₹ 1,525 crore IPO was subscribed 17.21 times and Ujjivan Financial Services Ltd received demand for 41 times the stock offered in its ₹ 885 crore IPO. 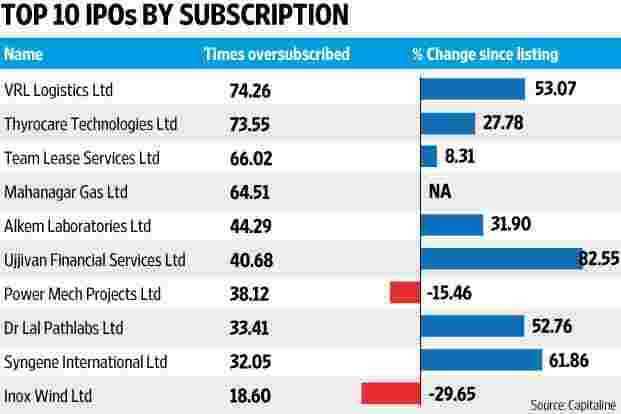 So far this year, 11 companies have raised close to ₹ 7,800 crore through the IPO route. About two dozen companies with valid regulatory approval are waiting to launch their issues to raise ₹ 10,000 crore more, according to Prime Database estimates. Last year, 21 companies raised ₹ 13,614 crore, a four-year high, as per Prime Database.